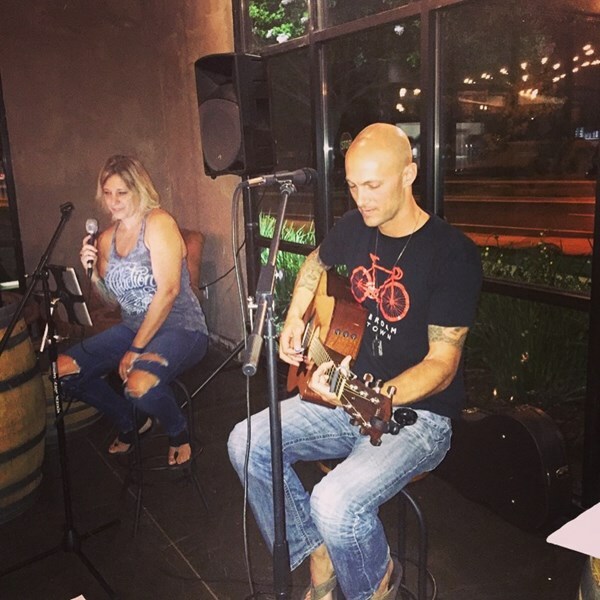 Anne Marie & Demian are a Northern California duo featuring Anne Marie Bannister on lead vocals and Demian Bannister on acoustic guitar and harmonies. They have spent the better part of the last decade performing at private parties, corporate events, weddings, and clubs all over the Bay Area, often performing under the name "Calm & Chaos". They play a wide range of songs covering multiple genres, as well as original music. Whether you want classic rock such as The Beatles, Tom Petty, Tesla, or Guns & Roses, country artists like Rascal Flats and Gretchen Wilson, alternative music from Foo Fighters, Gin Blossoms, Christina Perry and The Cure, or today's hits from Bieber to Niall Horan, they can easily modify their set list to fit your event. They can also typically learn songs not already in the repertoire to really customize your event. "Anne Marie & Demian were the perfect choice for our Spring get together. Very professional and extremely talented. Their repertoire was vast which made it fun for people requesting songs. Nothing but compliments at the end of the evening, would bring them back for our next party without question"
"Demian and Anne Marie did a wonderful job at my wedding. I requested a specific song for my walk down the aisle and their rendition was sooo beautiful!" 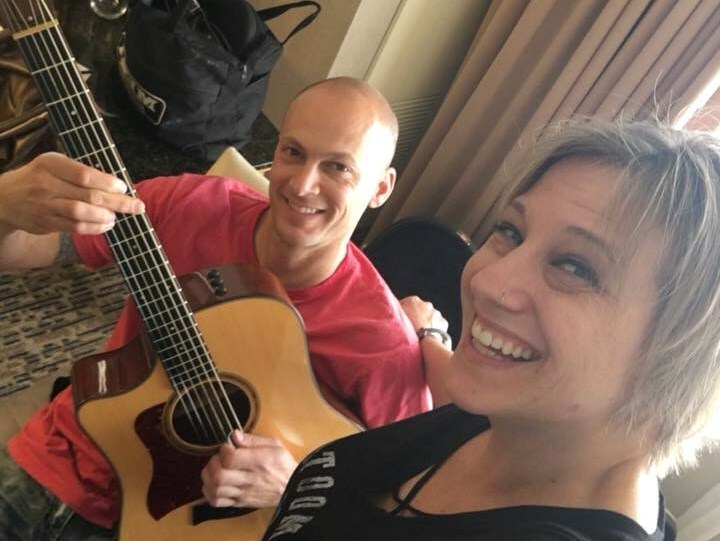 Anne Marie's voice draws comparisons to Chrissie Hynde and Karen Carpenter, and Demian has spent many years touring the states, receiving airplay on San Francisco Bay Area radio stations Live 105 and Alice Radio as the guitarist in several popular bands. 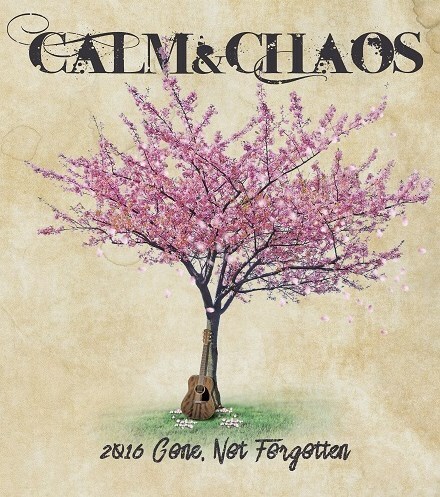 Calm & Chaos' debut original 12 song CD "Bad Decisions Make For Great Stories" was mastered by Marc DeSisto, reknowned for his work with U2, Pink Floyd, Sheryl Crow, Vertical Horizon, and many others. In 2017 they released an album of cover songs as a tribute to artists who passed away in 2016 titled "2016 Gone Not Forgotten", featuring acoustic interpretations of legends such as Prince, Glenn Frey, David Bowie, and George Michael. Their music can be purchased and streamed on iTunes, Spotify, and Napster, as well on their website! Demian & Anne Marie played at our church festival. They arrived ahead of time to make sure sound requirements were good to go. Great personalities. Music selection was great & their voices blended so well!! Highly recommend them. Thanks Chris! We really enjoyed ourselves and hope that your event was a huge success! These guys are true crowd pleasers, their song list is spectacular!!! Thanks Kathleen! Petaluma never disappoints, we will see you guys again next year for sure! Anne Marie and Demian were excellent! They communicated efficiently and timely prior to the event and showed up early for set up. Their mix of songs was great and the guests loved them. Our event was on a windy rooftop, which is less than ideal for singing, but Anne Marie was a professional and didn't waiver. I'd highly suggest hiring this fabulous duo! Thanks Kim! Yes it was windy but you couldn’t beat the view! Hope to work with you again! Anne Marie & Demain were fabulous! True professionals. You immediately know that they are experienced musicians. They are well prepared and handle all of their own setup needs and equipment. Anne Marie has a great voice and with Demian on guitar, they play beautifully. We hired them for a community event and would hire then again without hesitation. Highly recommend!!! Demian and Ann Marie were wonderful entertainers for my 50th Bday party. They communicated with me prior to event. They were very accomodating and incorporated my "wish list" song choice and emailed me back and forth a few times to make sure we were all set. Arrived on time, set up quickly. They delighted and entertained (first background) then later played to audience with some dancing even (which I did not expect). They harmonize and are in sync and just fun to be around. This was my first Gigmaster hire and I couldn't have been more pleased. They were great and I would used them again for another event or party. Thank you both! Please note Anne Marie & Demian will also travel to Dublin, Danville, Castro Valley, Diablo, Pleasanton, Alamo, Hayward, San Leandro, Oakland, San Lorenzo, Walnut Creek, Livermore, Moraga, Rheem Valley, Sunol, Clayton, Union City, Fremont, Lafayette, Concord, Orinda, Piedmont, Canyon, Alameda, Newark, Pleasant Hill, Berkeley, Brentwood, Antioch, Emeryville.